Distinctive racing yawls, tracing a long lineage to Devon coastal workboats, have been racing off the English town of Salcombe for generations. Here, the revolutionary NUFFIN (Y141), the boat that precipitated a split of the development class into two divisions in the 1980s, leads the fleet. Close behind are ANOTHER DILEMMA (Y173), FIRECREST (Y187), and SPRUCE GOOSE (Y177). All four boats were designed by Phil Morrison and sail in the Red Fleet, created after NUFFIN was built. One of the early yawls, FOAM, sailing under gaff rig in about 1906. When the class received sail numbers in the 1920s, she was allocated Y1—although she soon defected to the A class, where she won so often she was eventually banned. She was rescued and restored in the 1980s, though she no longer races with the yawl fleet. The Venus Café in East Portlemouth in South Devon, England, has a lot to recommend it. Organic pasties and homity pies, homemade scones and clotted cream, and a delicious range of locally made ice cream (mango sorbet being my favorite). It also has the best view of a unique fleet of wooden boats that despite its age provides some of the most competitive dinghy racing in the U.K. For this is the home of the Salcombe Yawl. And what a view it is. Sitting outside the café, the pretty holiday town of Salcombe stands on the other side of a large natural harbor set among steep, rolling hills. It looks like something out of a tourist brochure. Twice a day, the tide rushes in through the narrow channel between Salcombe and East Portlemouth, and twice a day it rushes out again, creating currents of 3 knots or more. The effect is slightly surreal, as the fleet of boats tacks from one side of the channel to the other, while simultaneously being swept sideways at considerable speed. Add to that dozens of buoys and boats on swinging moorings. 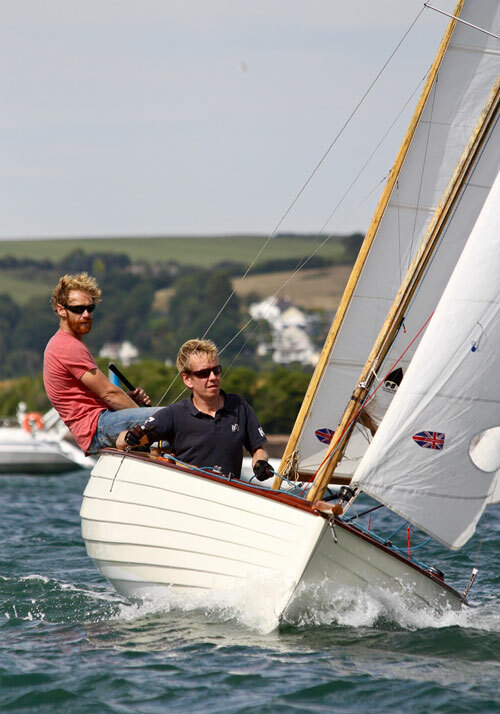 A fickle, often gusty crosswind is funneled in by those steep hills, and this breeze, combined with the current, creates the challenging sailing conditions that attract some of the top sailors in the country to race Salcombe Yawls. Few classes have been more hotly contested in recent years, and few have such a devoted following, consisting of local residents and wealthy visitors alike. Which is why a new yawl is likely to cost you upwards of £45,000 (about $56,000), while a top-notch, secondhand boat will fetch up to £25,000 (about $31,000). Not bad for a 16′ lapstrake-built wooden dinghy. 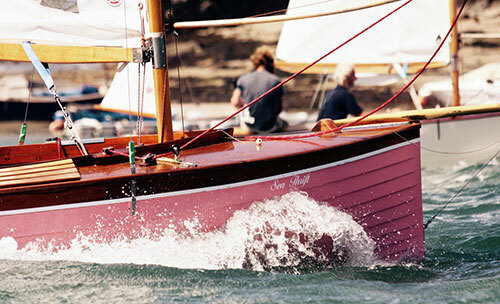 For such a small, essentially parochial craft, the Salcombe Yawl has a lively history. The class can trace its origins to the straight-stemmed, yawl-rigged working boats that operated off the south coast of Devon at least 200 years ago. Used for longlining and trapping lobsters, the boats had to be seaworthy enough to sail out of Salcombe into the prevailing southwesterly wind, fish off a rocky lee shore, and yet be burdensome enough to carry their catch home. Once at work, the fishermen would lower the mainsail and work under jib and mizzen. The boats, which were operated by one man, sometimes with a boy for crew, mostly fished the area between Start Point, 6 miles to the east, and Bolt Tail, 5 miles to the west. JAY DEE (Y82) was built by Jim Stone in 1971 for John Donovan at a cost of £610 (about $760). She was one of the boats to race “out of county,” winning the Lake Bala, Wales, championship in 1991. Donovan remained active in the fleet well into his 80s, often beating much younger sailors. His son, John Jr., is the current class measurer. At the helm here is Tom Napper, who is also a foredeck crewman for the J-class yacht LIONHEART. The first pictorial evidence of the type is in a scenic drawing of the town dated 1806. The early boats also were the subject of a print by artist William Daniell dated 1823. By 1853, they had acquired a name—the Licensed Watermen’s Boat Class—and a place in the annual Salcombe Regatta. The name clearly refers to their working-boat origins: a Waterman was someone licensed to work a ferry or as a pilot. The class seems to have been a fairly fluid affair at first, with boats ranging from 14′ to 18′ LOA, some half-decked and some open, although they all carried jibs and small mizzens. The boat that really launched the class, and also a boatbuilding dynasty, was a little black dinghy called BLACKBIRD. She was built in 1917 by Jim Stone, who was then just 16 and working as a shipwright for Edgar Cove in Salcombe, although he himself lived across the estuary in East Portlemouth. At 14′ long, she was one of the smallest boats in the fleet, and because Stone didn’t have any paint she was crudely finished in creosote preservative. Yet she was to prove almost unbeatable in racing when the class reconvened after World War I. During the 1920s, the class gradually increased in number, racing in the division for boats 16′ and shorter. Sail numbers started appearing in 1926, with Y1 allocated to FOAM, Y2 to BLACKBIRD, Y3 to EVELYN, Y4 to BLONDE, and Y5 to ELAINE. 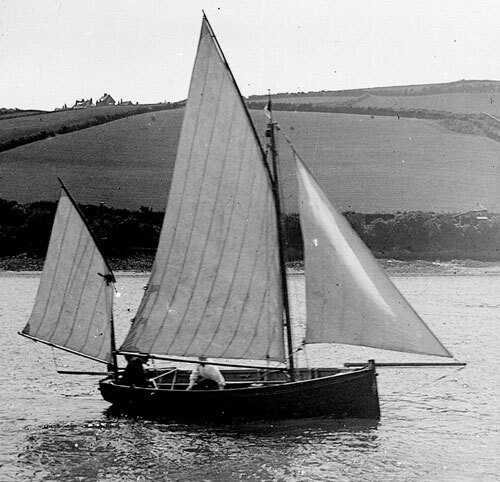 By 1930, the boats were known as Salcombe Yawls, and by 1935 they had their own start time under that name. But the class really got going in 1938 when the legendary British yacht designer Morgan Giles entered the fray. There are conflicting accounts about how this came to be, but it seems that his first design, AUBURN (Y15), was launched in 1938 and immediately outclassed the rest of the fleet—including the legendary BLACKBIRD. The design is said to have been based on Giles’s Teign Corinthian One Design, built of cedar and fitted with a 250-lb iron keel and a heavy iron centerboard. Crucially, too, she was Bermudan-rigged. Thereafter, all new yawls were fitted with Bermudan sails, with the exception of MARIE LOUISE (Y10), which was launched in 1938 with a gaff rig. All the older boats kept their gaff rigs and were mostly soundly beaten by their Bermudan brethren, with the exception of Richard Cove’s PRISCILLA (Y9), which regularly won races up until 1951 despite being a gaffer. She was eventually disqualified because she didn’t have the requisite iron keel and was therefore much lighter than the other boats. Auburn was followed the next year by EDRA (Y7), which also proved extremely fast. Not to be outdone, Stone built a new boat, BLACKBIRD II, during the winter of 1938–39. With his 12-year-old son, Alec, at the helm, the boat won five firsts and one second in six races in 1939. These three boats—AUBURN, EDRA (later renamed CHOICE), and BLACKBIRD II, all of them Bermudan-rigged—transformed the fleet and laid the foundations of the Salcombe Yawl class as we know it today. 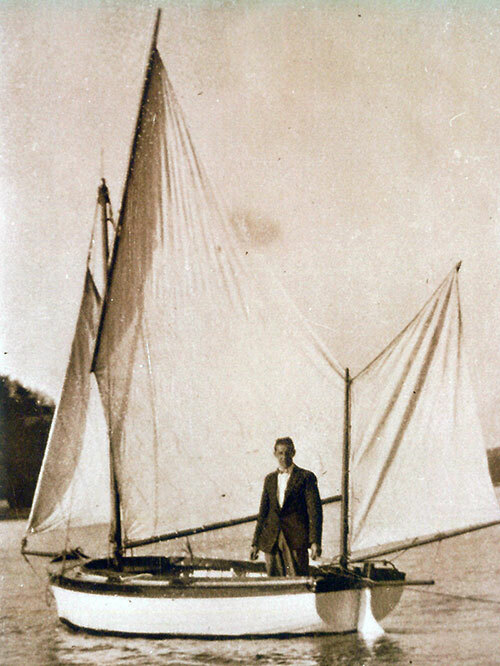 This photograph from about 1921 is believed to show Edgar Cove, of the legendary Cove boatyard in Salcombe, aboard one of his boats, a lug-rigged yawl with a sprit-rigged mizzen. Cove died in 1960, after which his sons continued building yawls at the Cove yard until the 1980s. The arrival of AUBURN led to the first set of rules for the class, limiting the length to 16′ and specifying minimum beam and deck sizes. The keel weight had to be between 112 and 140 lbs and the centerboard no more than 224 lbs. Lapstrake hull construction (known here as “clinker”) was specified, but with no mention of maximum overall weight. And so started a remarkable boatbuilding legacy that would last almost 50 years, as Stone built a string of yawls that would come to define the class. From 1947 until his death in 1986, he built one or two yawls almost every year. Once his son, Alec, also started building, their combined output reached up to five boats per year. By the time Alec built his last yawl in 1995, Stone & Son had built more than 80 boats, or more than half the fleet at that time. There were, of course, other builders, such as Edgar Cove, Powercraft, and Salcombe Yacht & Marine Co. in Salcombe and Douglas Winter at nearby Lincombe. 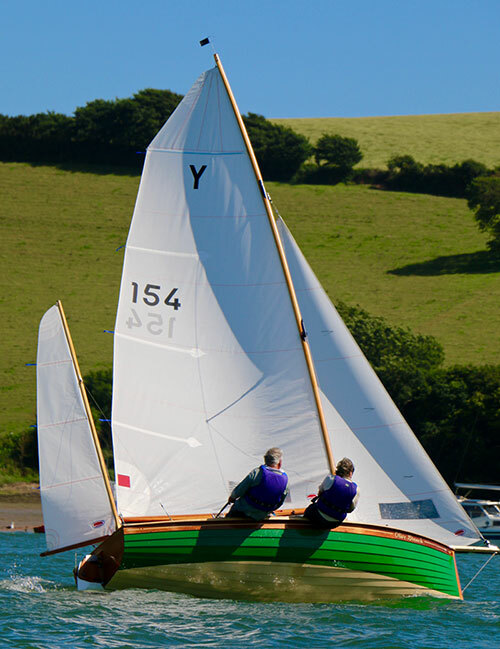 The class’s growth was noted in the annual report of the Salcombe Yacht Club (SYC), which observed that the yawls were particularly popular “among those who do not like acrobatics in their sailing.” By 1966, more than 60 yawls had been built, although many had by then migrated to other parts of the country. Despite this spate of boatbuilding, BLACKBIRD II and EDRA, their ages notwithstanding, dominated the racing for more than two decades after World War II. More than 50 yawls turned up for the 50th anniversary of the Salcombe Yawl Owners Association in 2016. This is the view from Salcombe looking across the estuary to East Portlemouth. TAYLOR MAID proceeded to win everything in sight, quickly leading to a reevaluation of the class rules. The main concerns were hull weight, since Taylor’s new boat was considerably lighter than the rest of the fleet. Beam was also a concern, since some boats were narrow and considered rather “cranky.” Some owners wanted aluminum masts allowed, since Sitka spruce was in short supply, but that initiative was swiftly quashed. In the end, the rules were extended, crucially, to specify a minimum overall weight of 840 lbs. In addition, the specifications for the centerboard included a minimum weight in addition to the existing maximum. The uproar caused by TAYLOR MAID and the subsequent modernization of the rules seemed to have a positive effect on the class, and in the two following years (1968 and 1969) 13 new boats were built—ten by the Stones, two by Taylor, and one by the new boy on the block, David Gibbens. That pattern continued unabated for the next 20 years, with over 40 new yawls launched in the 1970s and 27 more in the 1980s. And it wasn’t just in Salcombe that these wooden yawls were triumphant. A convoy of six of them took part in races at Lake Bala in Wales for three years running, with DIPPER (Y134) winning in 1988 and 1989, and JAYDEE (Y82) triumphant in 1990. And there were tales of heroics, as when Alec Stone (by then eight times Solo National Champion and International Solo Champion of 1971) and his wife, Kath, took their yawl SWALLOW (Y114) to the Hellevoetsluis Classic Yacht Regatta in Holland in 1989. On the last day, as the wind built up to a Force 8, SWALLOW’s mast broke, but Alec and Kath carried on regardless, winning their class and coming first overall on handicap, despite being one of the smallest boats in the fleet. Yawls made their first appearance in fiberglass when a mold was taken off the successful Powercraft-built yawl LUCINDA (Y45). These were marketed as Devon Yawls—an entirely separate class that would be sold in the hundreds both in the U.K. and the United States. 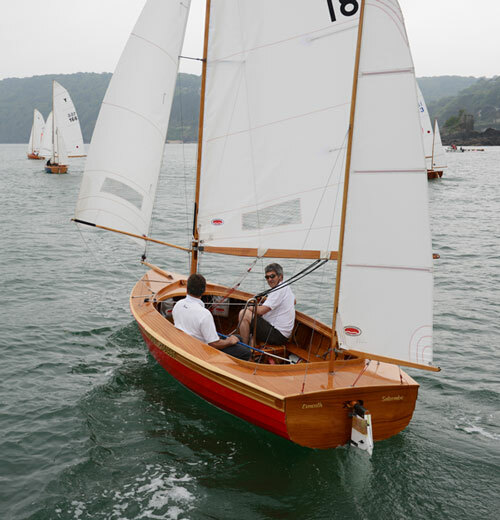 The lapstrake-planked and plumb-stemmed Salcombe Yawls are powerful boats and race aggressively. Shown here is SEA THRIFT (Y93), built in 1973 by Jim Stone. Stone and his son, Alec, played a major part in the development of the class and were responsible for half the boats built before 1995. Because this is a development class, it wasn’t long before the next design to rock the Salcombe Yawl fleet was launched—and this time it would quite literally split the class in two. NUFFIN (Y141), designed by Phil Morrison of Merlin Rocket and International 14 fame, represented another quantum leap in Salcombe Yawl design. With her fine forward sections and wide beam carried well aft, she was a thoroughly modern boat that could plane in even a moderate wind. The question was, was she really in the same spirit as boats built over the previous 70 years, or was she just an all-out racing machine? Donovan measured six “traditional” yawls, ranging from a 1969 Peter Taylor boat to the latest boat by Mike Atfield, launched soon after NUFFIN. He was thus able to show that the Morrison boat differed from the average boat by being narrower at the bow and much wider overall. He proposed a measurement “envelope” that would exclude such extreme shapes. An extraordinary general meeting of the SYA was held December 17, 1989, at which it was once again asserted that “most members still wanted the Salcombe Yawl to be a family boat which is raced rather than allow it to develop into an out-and-out racing class.” Furthermore, “members expressed their sympathy for the owner of Y141 who had commissioned it in good faith, but nevertheless felt it was too radical and that the motion must be passed.” The motion in question established a new set of construction rules, including Donovan’s envelope, and it passed with a large majority. Ironically, Jim Stone’s yawl, BLACKBIRD II, built in 1939, was one of the boats that wouldn’t fit the new envelope. Because the new measurements only applied to future boats, however, both BLACKBIRD II and NUFFIN were still allowed to race. RED ROOSTER (Y184), a Morrison Mk5 built by Exmouth boatbuilder Peter “Spud” Rowsell in 2008, is one of the fastest boats in the fleet. The cockpit coaming’s radiused corners aft are a distinctive style of Morrison-designed boats. Showing a new set of rules to a yacht designer is like holding up a red flag to a bull, however. Morrison soon responded with REWSTER (Y145), which pushed the envelope to its limit and once again produced a boat that could plane in moderate wind. It was known as a Morrison Mk II. Two years later, he was back with OLIVE BRANCH (Y154), an even faster design that became known as the Morrison Mk III. As the local builders and designers responded in kind, it was clear that the older, pre-NUFFIN boats could no longer compete with new yawls. In 1990, the yawl fleet was split into two divisions: the Blue Fleet, which was made up mostly of boats built before Y141, and the more competitive Red Fleet, comprising newer boats. 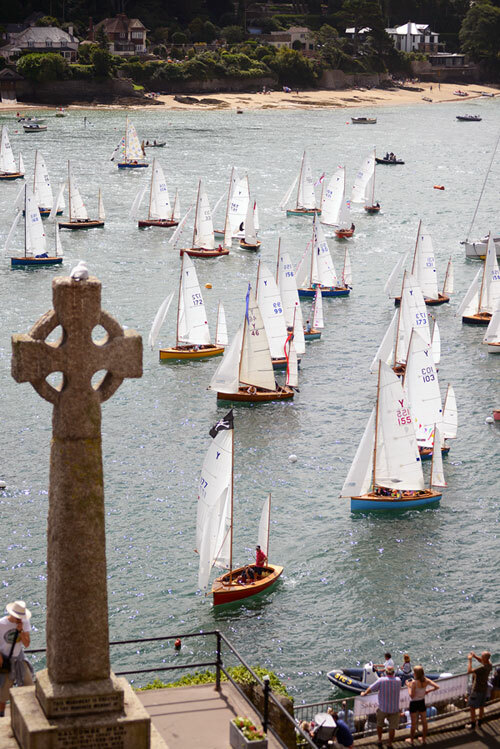 In some ways, it was an easy decision to make, as the Salcombe Harbour Authority had already complained about there being too many boats—up to 30 of them—on the starting line at the same time. But owners were understandably concerned that the Blue Fleet would be eclipsed by the more exciting Red Fleet. Despite these worries, two further divisions were subsequently created: a Gold Fleet for beginners, and a Green Fleet for post-Y141 boats that didn’t want the excitement of the Red Fleet but were too competitive for the Blue Fleet. The Gold Fleet gradually died out, while the Green Fleet is only occasionally used at major regattas. It was a sign of the excitement generated in the class at this time that Ian Howlett, a top AMERICA’s Cup and International 14 designer, dabbled in what could be viewed as an archaic type of wooden boat. His first yawl, STORM (Y168), was designed for boat restorer Jim Stone (a cousin of the Jim Stone of BLACKBIRD fame) and longtime yawl sailor Will Morrison, best known for his success on the International 14 circuit. She was the first yawl to have a “dangly pole” to hold out the jib—a development made possible by a change in the national sailing rules that hadn’t been spotted by anyone else. She quickly proved unbeatable, especially downwind. She was followed a few years later by the Howlett Mk II, BLACK TERN, the first yawl planked with lightweight Sitka spruce since BLACKBIRD II. And so it went on, as yawl racing turned into a battlefield of the designers, with Morrison and Howlett trying to outclass each other with successive designs—much to the delight of local boatbuilders. Fourteen yawls were built between 2001 and 2004. Five more were built before the spree was brought to a grinding halt by the economic collapse of 2008. By then, demand for new Salcombe Yawls had driven prices up to the silly levels previously mentioned. 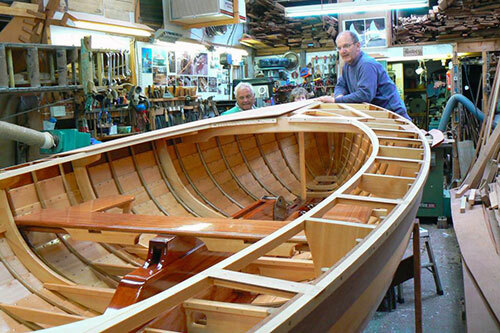 The most recent yawl, GREAT BUSTARD (Y189), was built in 2011 by Mike Atfield (right) to an Ian Howlett design. Mahogany was used extensively for the interior. Note also the sawn frames added used to stiffen an otherwise extremely light construction. She is said to have cost more than £45,000 (about $56,000). The most recent, in 2011, was GREAT BUSTARD (Y189), designed by Howlett. Since then, the new boat market has softened, but it has improved for boats in the Blue Fleet, now regarded as “classic” and therefore as better investments in the long run. It’s an outcome that few of those who debated splitting the fleet back in 1989 could have predicted. Like all development classes, the Salcombe Yawl is constantly changing, responding to the latest trends and technology. Some of those changes can be quite subtle. During the 1940s, the centerboard tackle was replaced by a winch—of bronze initially, then wood, then Tufnol, and finally of plastic. Since the mid-1950s, most boats have been fitted with jam cleats for the main and jib sheets, although here, too, the original bronze was gradually replaced by Tufnol and then plastic. The same is true of wooden blocks. Roller-furling for jibs became popular after they were fitted to the Salcombe Yawls’ fiberglass sisters, the Devon Yawls, in the 1960s. GREAT BUSTARD is lapstrake-planked with Sitka spruce over steam-bent white oak frames, with copper rivets holding it all together. Her hull was painted white, offset by a bright-finished mahogany sheerstrake. Boomkins were omitted during the 1970s, and the mizzenmast now sits on a small aft deck with its sheet passing down through a hole before running forward to a jam cleat. The tiller, however, still runs under the aft deck and penetrates the transom. All the spars remain solid wood—no hollowing is allowed—although their diameters are left to the discretion of the builder and vary depending on the owner’s preference for either flexibility or stiffness. For those at the top of the fleet, a slight shaving off the thickness of the mast can make all the difference. 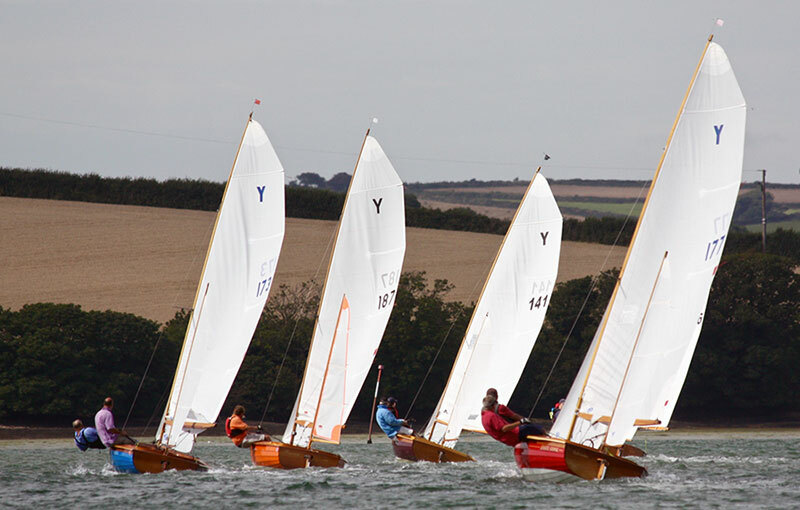 The extreme roach evident on modern yawls was introduced by Salcombe sailmaker Jon Alsop in the late 1970s and notably improved performance, especially downwind. OLIVE BRANCH was the first Salcombe Yawl built by Exmouth boatbuilder Peter “Spud” Rowsell after he teamed up with designer Phil Morrison in 1990. He went on to build 10 more yawls to the same “Morrison MkIII” design. Rowsell is best known for building very successful Merlin Rockets. More than 50 boats gathered for the anniversary of the SYOA, and they made a spectacular sight as they paraded past the SYC, first in order of age and then all together over the line—the biggest single lineup of yawls ever seen. It was an interesting time in the class’s history; there is no denying the energy and enthusiasm for these boats, but at the same time there are clearly some jitters about where the class is headed and, most important, when the next boat will be built. Meanwhile, as long as the tide rushes in and out and the sea breeze brings its usual afternoon lift, the yawls will battle it out with seemingly unending enthusiasm on this idyllic stretch of water. Nic Compton is a freelance writer and photographer based in Devon, England. 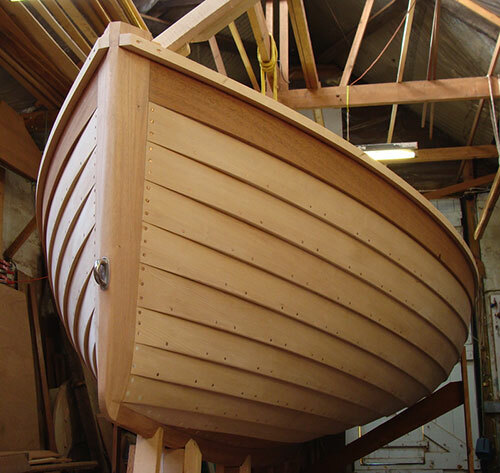 He has written about boats and the sea for 22 years and has published 13 nautical books, including a biography of the designer Iain Oughtred, available at www.woodenboatstore.com. He currently rows and motors a 14′ Western Skiff and sails a 22′ Romilly, both designed by Nigel Irens. The author is indebted to Tim Street for his history of the Salcombe Yawl and to Tristan and Jim Stone of Stones Marine Timber for their indefatigable support.